Tray Dryers are a common method of dryer wetcakes and granulated drug products. This is especially true in the early product development phase. The issue of containment for this type of process equipment is unique in that open scooping of powder onto multiple trays that get slotted into the dryer one at a time prohibits a mass, single transfer as with charging a vessel through a nozzle. There are many styles of Tray Dryers on the Market and installed that drive the Engineering Control here to a custom design. However, containment is accomplished with a standard set of interface and design techniques. The various styles of dryers, interfaces, door types, volumes, ergonomics, and life cycle costs must all be taken into account in order to meet the need of containing the dryer. Included here is whether the dryer is portable or a fixed installation. The final design may vary from operation to operation but a typical installation includes adding a flange to the face of the dryer to the outside of the door. 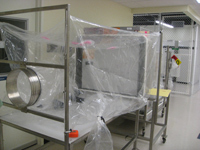 An enclosure made from the rugged ArmorFlex family of films is then attached to the flange and a supporting frame assembly. These features will allow for opening the door within an enclosed environment when loading and unloading the trays with the drug product. Attach the enclosure to the support frame using the bungee cords supplied. Also attach the enclosure to the BIBO canister. Scoop material from the bags onto the dryer trays, load the trays into the dryer and close the dryer door for processing. After the drying process is complete, open the door, remove the trays within the enclosure and scoop the powder into plastic bags which in turn will be placed through a bag-out sleeve. Alternatively, the powder can be scooped directly into a DoverPac, Continuous Liner, or Transfer Sleeve. Crimp, cut a remove the contained materials for further processing. After processing is completed, spray mist the inside of the enclosure as part of the overall wash down. The flexible enclosure will then be removed from the dryer while wearing personal protective equipment (PPE) as part of the wash down process.